Power Kiting Lessons – An introduction to kite flying and brilliant fun! Kite Buggying – Initially learning to fly the power kites and then using them to pull yourself along the beach in a 3 wheeled cart. Ideal gift idea. Kite Landboarding – Moving on from powerkiting to being pulled along the beach on an offroad skateboard. 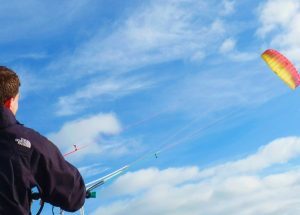 Kitesurfing 1 day taster course – An introduction to the sport covering the basics of kite flying. Involves loads of practical and epic fun but doesn’t cover board starts. Kitesurfing 2 day course – A good introduction to the sport continuing from the 1st day, spending most of the time in the water and introducing the board. Kitesurfing 3 day course – Continuing from the 2 day course but practicing board starts, controlled riding, turns and stops. 5 Day ‘Zero to Hero’ Kitesurfing – A course aimed for those really aiming to get into kitesurfing, starting from the beginning but covering a substantial amount. Kitesurfing 2nd day – For those who have completed day 1 and wish to continue with this great sport. Board Control – For those who have completed a 2 or 3 day course or similar, that are aiming to board start under control, continue runs and introduce turns. Coaching – Advanced courses for kitesurfers looking to perfect techniques or learn new tricks. Private tuition – The optimum way to learn any of our sports, ideal for those with limited time or looking for a tailor made course. Hydrofoil Kitesurfing Lesson – For more experienced kitesurfers who want to learn to use a hydrofoil. 8 week training course – Intensive course taking you from a beginner to fully qualified powerkite, kite buggy & landboard, kitesurf and SUP instructor. Snowkiting – Learn to ride all around the mountain in the beautiful Italian Alps, we will be running a couple of trips out here throughout the winter but why not go yourself too. No kite experience necessary. Great for complete beginners to those advanced and wanting to learn tricks and jumps. Instructor training courses – Become an instructor of these amazing sports! !